For a country whose revolution was so thrillingly modern,the counter-revolution has been a dreary affair. Aside from the expected and customarily grisly sprees of violence, the modus operandi of the now-ascendant military regime has been to restore, under the pretense of legal legitimacy, the hallmarks of the status quo. Ensconced in the military’s imposed legitimacy, other government branches have further silenced the not-so-loyal opposition—the Islamist Muslim Brotherhood—by labeling them a terrorist organization. And it is at the mercy of the judiciary that Brotherhood-backed ex-president Muhammad Morsi now kneels, toppled last year by a military putsch to stand trial for “insulting the judiciary.” Liberal theorists often strain to analyze law distinctly from power; in Egypt, it is hard to think of the new constitution as anything but Old Power, codified, with the judiciary and legislative branches serving merely as its agents. It is rather telling, then, that the new constitution opens with reference to “the beginning of history.” At the outset, the constitution declares its commitment to the old; this potential symbol of change has devolved into merely the latest prop in the repertoire of counter-revolution. Admittedly, the archetypal instance of non-revolutions is none other than the American Revolution. Charges of American imperialism are as old as the nation itself—which is not a trivial accusation for a state premised on the repudiation of empire. W.E.B. Du Bois once said, for example, that American blacks occupied “in their economic and political condition a distinctly colonial status;” and race is only the most obvious and pernicious blemish of post-revolutionary America. With property relations and social hierarchy as the benchmarks, the colonial uprising’s ideals seem woefully distant. Still, if the American revolutionaries can boast of any achievement worthy of the name, it would have to be theoretical. Philosophically, the Revolution heralded the concept of sovereignty vested in the people, and the Founders framed a constitutional structure that sought painstakingly to instantiate that concept, even if it took years for all Americans to get those rights. At the very least, the American Revolution announced a rupture with the narrative of history. By denouncing monarchial privilege, it made liberty the sole raison d’être of government. There are two noteworthy effects of this narrative continuity. 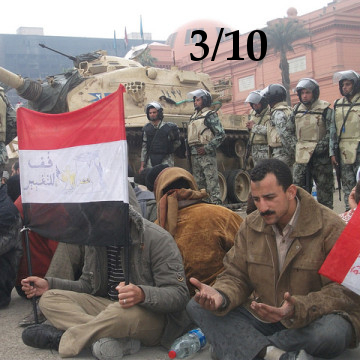 First, it renders Egypt’s seesaw between dictatorship and military overthrow less a series of hiccups, and more like par for the course. Here, the constitution does not announce a new Egypt birthed from the labor of revolution, but instead declares the maturation of an ancient nation dating to the pharaohs, one in which the military has always held a place. 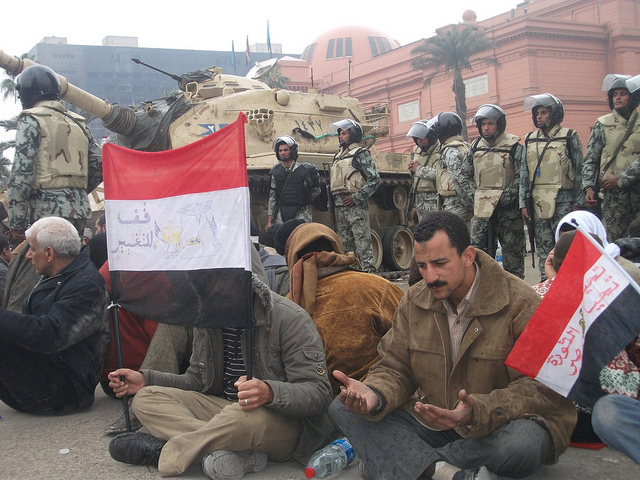 The military’s political custodianship is simply and legitimately embedded in the process of national evolution; indeed, the army is Egypt’s so-called “pillar.” Secondly, the narrative reaffirms what the exemplary men and women in Tahrir Square knew all along: that the army is an entity distinct from the people, whose destiny depends to an alarming degree on those in power. In the context of the army’s longstanding role in Egyptian history—and the preamble’s affirmation of that role—certain constitutional provisions seem rather conspicuous. The power of the military is deeply embedded in this new constitution as Article 201 places at the army’s helm a commander-in-chief appointed from among the army. Article 234 subjects the commander-in-chief’s appointment to the approval of the army’s own Supreme Council. To add insult to unaccountability, the military’s budget is determined not by legislators, but by the National Defense Council. This is to say nothing of less obviously militant matters—like Shari’a being “the principle source of legislation,” or freedom of religious practice being restricted to the “revealed religions.” With these terms embedded in the constitution itself, it seems as though there will simply be more of the old. It may be premature to wax pessimistic on a constitution only recently approved, but the narratives behind law provide their own premonitions. In Egypt, the constitution legitimizes the narrative paradigm of bloated, ancient authority, inseparable from military primacy and prerogative. One would have hoped to see “the heart of the whole world” do better. Citation: Jordan Calazan Manalastas, Egypt’s Constitution: The Narrative of Counter-Revolution, 2 Cornell Int’l L.J. Online 27 (2014). Michael R. Gordon & Kareem Fahim, Kerry Says Egypt’s Military Was ‘Restoring Democracy’ in Ousting Morsi, N.Y. Times, Aug. 2, 2013, at A7, available at http://www.nytimes.com/2013/08/02/world/middleeast/egypt-warns-morsi-supporters-to-end-protests.html. See John Kerry, Remarks by Secretary of State John Kerry on Egypt’s Constitutional Referendum (Jan. 18, 2014) (transcript available at http://www.state.gov/secretary/remarks/2014/01/220036.htm). See David D. Kirkpatrick, Overwhelming Vote for Egypt’s Constitution Raises Concern, N.Y. Times, Jan. 18, 2014, at A7, available at http://www.nytimes.com/2014/01/19/world/middleeast/vote-validates-egypts-constitution-and-military-takeover.html. See Egypt: Activists Arrested for ‘No’ Campaign, Human Rights Watch (Jan. 13, 2014), http://www.hrw.org/news/2014/01/13/egypt-activists-arrested-no-campaign. See, e.g., Sam Gustin, Social Media Sparked, Accelerated Egypt’s Revolutionary Fire, Wired, (Feb. 11, 2011 2:56 PM), http://www.wired.com/business/2011/02/egypts-revolutionary-fire/. See Greg Bortelho, Josh Levs & Ian Lee, Egypt on Edge After at Least 278 Killed in Bloodiest Day Since Revolution, CNN, (Aug. 15, 2013, 10:51 AM), http://www.cnn.com/2013/08/14/world/meast/egypt-protests/. See Salma Abdelaziz and Steve Almasy, Egypt’s Interim Cabinet Officially Labels Muslim Brotherhood a Terrorist Group, CNN (Dec. 25, 2013 4:17 PM), http://www.cnn.com/2013/12/25/world/africa/egypt-muslim-brotherhood-terrorism. See Sarah El Deeb, Egypt Prosecutors Send Ex-President to New Trial, AP Big Story (Jan. 19, 2014), http://bigstory.ap.org/article/egypt-prosecutors-send-ex-president-new-trial. See, e.g., H.L.A. Hart, Positivism and the Separation of Law and Morals, 71 Harv. L. Rev. 593, 602–3 (1958). The Arab Republic of Egypt Draft Constitution Dec. 2, 2013, pmbl., available at http://www.atlanticcouncil.org/images/publications/20131206EgyptConstitution_Dec.pdf.pdf. Jonathan Adelman, Historically, Egypt’s Revolution is More of the Same, Reuters (July 8, 2013), http://blogs.reuters.com/great-debate/2013/07/08/historically-egypts-revolution-is-more-of-the-same/ (noting that while the American Revolution is often cited as a “bastion of liberty,” the reality of the initial government-making failed to carry out this ideal, and expansive, principled liberty was only achieved through a long process of democratic expansion). W.E.B. Du Bois, The Colonial Groups in the Postwar World, in Against Racism: Unpublished Essays, Papers, Addresses, 1887–1961 229, 229 (Herbert Aphteker ed., 1985). See Adelman, supra note 11. See generally U.S. Const. ; Adelman, supra note 11. See The Declaration of Independence para. 2 (U.S. 1776) (“[T]o secure these rights, Governments are instituted among Men.”). The Arab Republic of Egypt Draft Constitution, Dec. 2, 2013, pmbl. See id. at art. 201. See id. at art. 234. See id. at art. 203. Next Article The Abolition of Presidential Term Limits in Nicaragua: The Rise of Nicaragua’s Next Dictator?